Abstract: According to the traditional picture, the Christianization of Palestine since Constantine led to a rapid deterioration of the position of the Jews already during the Byzantine period. Michael Avi-Yonah entitles his chapter dealing with the years 363-439 “The Great Assault on the Jews and Judaism.” If one reconstructs the history of the period, mainly on the basis of the Christian legislation and of some church fathers, this looks reasonable. However, if one takes into account a wider range of sources, the vast Jewish literature from these centuries and the rich harvest of the archaeological excavations made during the last decades, one discovers a quite different picture: most excavated synagogues were constructed after the prohibition of new synagogues; their architecture and decoration is closely parallel to that of contemporaneous churches; sometimes churches and synagogues stood side by side and mutually influenced each other. This shows for long periods a peaceful coexistence and a vigorous and self-conscious Jewish community. 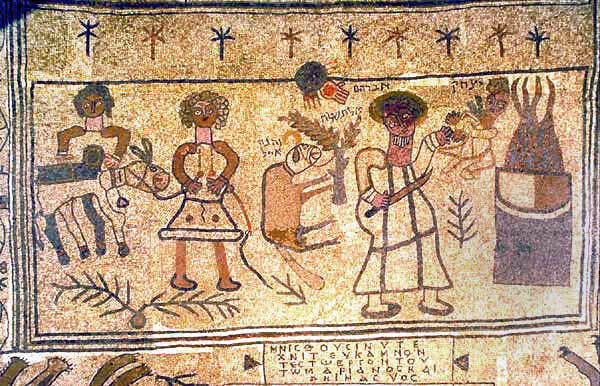 Only in the early seventh century the situation deteriorated rapidly until under the new Arab rule, both Jews and Christians found themselves as minorities. Günter Stemberger was born in Innsbruck, Austria, in 1940. He studied Theology and Judaism in Austria, England, and France. After his doctorate in 1967 and further studies at the Biblical Institute in Rome, he was research assistant at Duke University in the United States. Following a research stay in Jerusalem, he held the position of professor of Jewish Studies at the University of Vienna from 1977 until 2009. His main fields of research are rabbinic literature, the history of the Jews in pre-Islamic Palestine and the relations between Judaism and Christianity in Late Antiquity. He is the author of over twenty books, some translated into several languages, and numerous articles. His publication most relevant to the topic of this lecture is Jews and Christians in the Holy Land. Palestine in the Fourth Century (T&T Clark, Edinburgh, 2000).